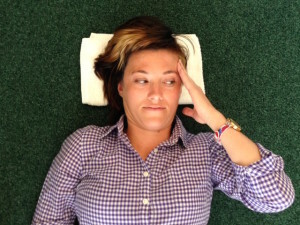 If you have experienced neck pain or had a neck surgery–and have been cleared by your surgeon and physical therapist–please check out the following gentle neck movement exercises and isometric (no movement) strengthening exercises. For all exercises, please spend time finding neutral spine. The position of neutral is slightly different for each person, but the concept is the same. 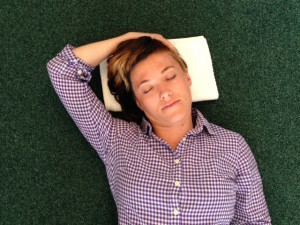 In backlying (supine) neutral spine is a position where the neck muscles are able to be relaxed and the chin is perpendicular to the floor. 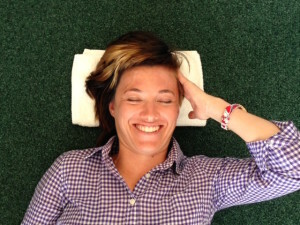 Depending on the position of your upper back and neck, you may need to use a towel to support the back of the head to ensure that you can achieve neutral spine without strain to the neck muscles. 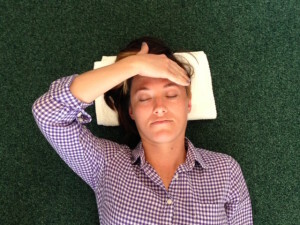 Begin by placing your right hand gently on the opposite side of your forehead, then start turning your head with both your neck muscles and your hand toward the right. At the end of the motion, return to the start position. Repeat 5-10 times. Stop when you encounter any resistance or if you are unable to maintain rotation without side-bending the neck. 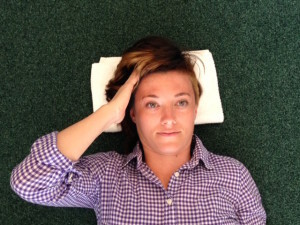 Begin by placing your right hand on the opposite side of the top of your head. Gently begin moving your right ear toward your right shoulder. Again, stop when you encounter resistance. Perform 5-10 repetitions. Place your fist gently against the bottom of your chin and simultaneously, against the front of your neck at your throat. Without creating any movement, nod your chin into your fist (while your fist resists this motion). 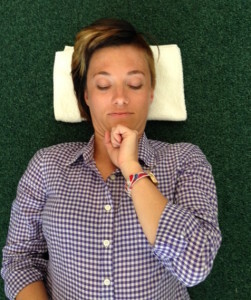 This exercise works the deep neck flexor muscles (longus colli). 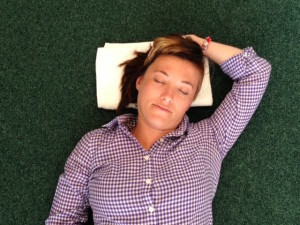 Looking down with your eyes helps to facilitate proper muscle activation. Effort for an isometric exercise is sub-maximal, nod your chin down with 10-20% effort. Hold this for 10 seconds. Repeat 10 times. *If your shoulders pop up off the ground as you activate your deep neck flexors, try using less effort. When your shoulders come off the ground, your body is recruiting compensatory muscles. 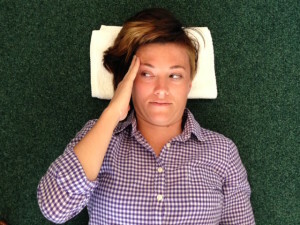 Place the right hand on the right side of the forehead. 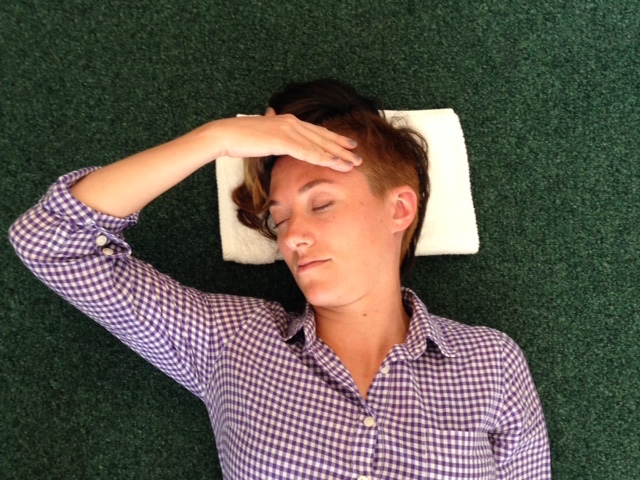 Gently apply pressure through the hand as you activate your muscles against your hand turning your head to right. Remember that no motion occurs because this is an isometric exercise. Use your eyes to facilitate proper muscle activation by looking toward the right. The amount of effort is 10-20%. Hold for 10 seconds, complete 10 repetitions. *Attempt to not actually rotate the head and neck for this exercise. It is more difficult than it appears. Place your right hand on the right side top of your head. Imagine bringing your right ear to your right shoulder but resist this motion with your hand to maintain the isometric component. Use 10-20% effort. Hold for 10 seconds, complete 10 repetitions. Then smile, you just took care of your neck!